New Zealand resumed their second innings with 26-2 on scoreboard and still trailing Pakistan by 48 runs on day four of Abu Dhabi Test. On day two, scores of 134 and 104 by Azhar Ali and Shafiq Shafiq respectively were not complimented by any other batsmen with the star on their chest. 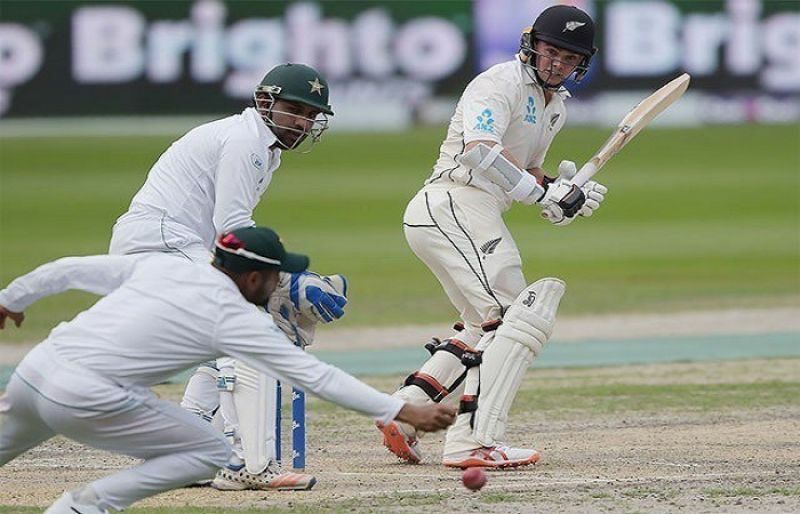 The third highest score was that of Haris Sohail (34), who had helped Azhar after Pakistan lost their openers early on day two when asked to reply to New Zealand’s first innings total of 274. Next best was captain Sarfraz Ahmed with 25 off 60 balls with just two boundaries to his name. Babar Azam’s struggle in the longer format continued as he added only 25-ball 14 to his team’s cause. However, Pakistan will still be happy as they sent back New Zealand’s opening pair of Jeet Raval and Tom Latham courtesy Shaheen Afridi and Yasir Shah respectively to end day three on a high note. Earlier, Pakistan batted on flawlessly to add to their overnight score of 139-3 courtesy Azhar and Shafiq, but as soon as the former fell, the Men in Green lost their remaining six wickets after adding only 62 runs and notching up a total of 348 all out — a 74-run lead. For New Zealand, 34-year-old Test debutante William Somerville bagged four wickets with his right-arm offbreak in 36 overs, giving away 75 runs courtesy eight maidens. Meanwhile, Ajaz Patel (35 overs, 100 runs) and Trent Boult (26 overs, 66 runs) accounted for two batsmen each. Tim Southee bagged the lone scalp of Haris for 56 runs in 25 overs, while Colin de Grandhomme went wicketless in his 13 overs, where he gave away 36 runs. The series stands at 1-1 after New Zealand and Pakistan won the first and second Test respectively.